Click chart for more on Apple's stock. Apple's reign as the world's most valuable company ended Friday. 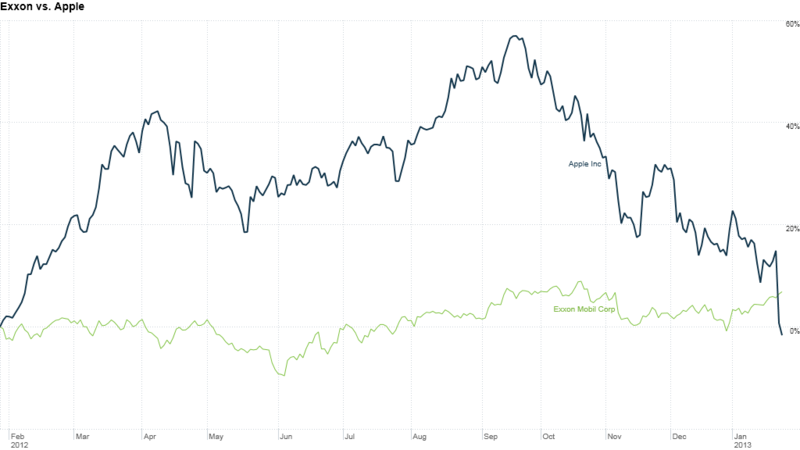 Exactly one year after Apple (AAPL) became the world's most valuable company, it lost that title to Exxon (XOM) as its shares slipped to $439.88. The precipitous decline has caused Apple's stock to drop in value by about $250 billion since hitting its all-time high of $705 in late September 2012. Since then, the stock has also tumbled more than 35%. With its market capitalization hovering around $413 billion, Apple is now worth $5 billion less than Exxon. Apple's stock plunged more than 12% Thursday, after the company disappointed investors with its somewhat tepid forecasts for iPhone sales. Shares of Apple continued to fall Friday, sliding more than 2%. "It's a fire sale right now. A lot of retail investors who bought at much higher prices have panicked," said Laurence Balter, chief market strategist at Oracle Investment Research. Still, Balter said that while individual investors may be racing out of the stock, mutual funds and other so-called institutional investors have been buyers over the past several days. With the recent decline, Apple is a relative bargain, trading at nearly 10 times earnings estimates, down from a PE of 15 when the stock was at its highest point. Compare that to Google (GOOG), which currently trades at 16 times its expected 2013 earnings. A slew of analysts swiftly downgraded Apple's stock after the company's disappointing iPhone sales outlook. That's not helping the stock much. CNNMoney's Hibah Yousuf contributed to this report.